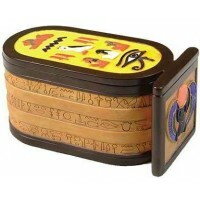 This cold cast resin King Tut cartouche box is beautifully hand finished with amazing detail. The lid of the box is inscribed with the name of Tutankhamun and reads as follows: Tut Ankh Amun (Perfect in the life of Amun), ruler of On (Thebes, today’s Luxor) of Upper Egypt. 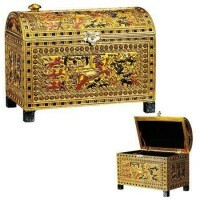 It is based on a piece discovered in the tomb of King Tut. 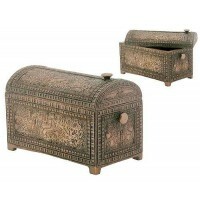 This cold cast resin cartouche box is beautifully hand finished with amazing detail. Measures 3 x 6 3/4 inches with lift off lid. Interior is felt lined. Item Number: YT-7441 | Approximate Size (Inches): 3.00 wide x 4.00 deep x 6.75 high | Approximate Shipping Weight: 2.00 lbs.